Institute of Child Health, Kolkata, 11, Biresh Guha, Street, Kolkata 700 017. E.S.I, Maniktala, 54, Bagmari Road,Kolkata – 700 054,West Bengal. Netaji Subhash Chandra Bose Cancer Research Institute (PHD Course),16A, Park Lane,Kolkata – 700 016. 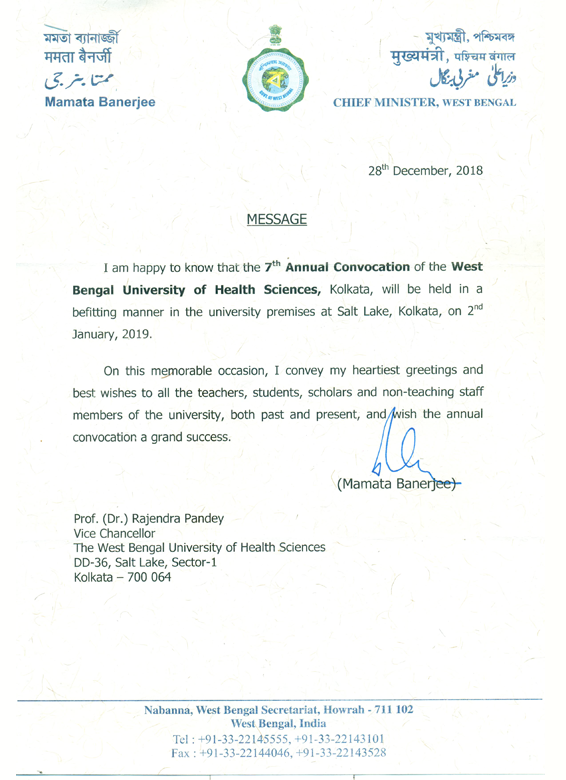 ICARE Institute of Medical Sciences and Research & Dr. Bidhan Chandra Roy Hospital "Haldia Health City"
Kusumdevi Sunderlal Dugar Jain Dental College & Hospital’ at 6 Ramgopal Ghosh Road, Kolkata – 700 002, W.B. College of Nursing,Institute of Psychiatry-COE- 7,D.L. Khan Road, Kolkata-700025. Rampurhat Government Medical College & Hospital, Batail 104.,Plot No.260, NH 60, Rampurhat, Distt: Birbhum, Pin – 731224, West Bengal. *THE LIST IS PURELY PROVISSIONAL, IN CASE OF ANY MODIFICATION CONTACT UNIVERSITY WITH PROPER DOCUMENTS…..